On the slopes of a mountain in Northern Spain is El Castillo Cave. At the back of this cavern, near the end of almost 200 meters of twisting passages, are several hundred red discs. These simple shapes might not look that impressive, but their (pre)historic significance sure is. 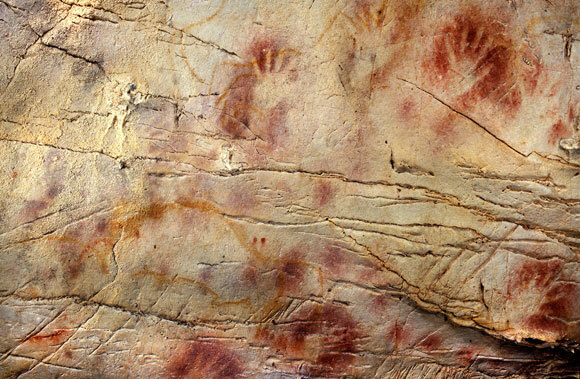 It turns out they’re the oldest known cave paintings humans made, dating close to 40,000 years ago1! But how did they do it? What tools and techniques did these early artists use? Figuring this out could provide an insight into the lives of these ancient people, telling us how many were involved, who they were, how much they knew about their environment (and which parts of it would make great paint). All providing a snapshot of life in the stone age. How did they make cave paintings? Answering this question is fairly straightforward. If we take a closer look at these cave paintings, we find they have all the hallmarks of being sprayed onto the wall. 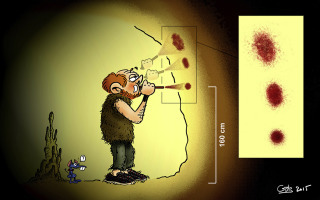 Upper Palaeolithic humans were tagging walls before it was cool1. Obviously, back in the stone age, they didn’t have spray cans, but there are a few ways you can achieve this effect with the technology available at the time. Thanks to experimental archaeology (aka, having a lot of fun playing around with ancient tools to figure out how they work) we know of a few ways this could be done. Most likely, either through placing paint in a straw and blowing through it, or holding the paint in your mouth and blowing it out a straw1. I’ve had a go at these methods myself and can assure you they’re very messy. Doing these experiments also resulted in a lot of pictures of me drinking paint. Don’t worry, I spat it out afterwards. So it’s perfectly healthy right? d’Errico et al. also did this in more experimental (aka neater) conditions. They found that prehistoric artists used all these different techniques, explaining some of the variation seen in the discs as each approach produces slightly different circles1. Of course, figuring out what the paintbrush (paintstraw?) was is only half the battle. What paint were they spitting through them? Well, to figure this out d’Errico et al. also did some microscopic analysis, x-ray diffraction, and a whole bunch of other tests with all sorts of weird acronyms. Some even featured Greek letters. These revealed that the pigment was a mixture of clay and iron oxide, that was then likely mixed with a liquid binder like water (or if you’re feeling morbid blood). Zoom and enhance! From left to right they zoom in on each dotted square to figure out the materials used in the pigment1. This mixture does occur naturally in the form of ochre. However, it seems the artists weren’t using that pre-made material. Instead, they were mixing clay and iron oxide themselves; in some cases with a grindstone as indicated by microscopic rock fragments left in the paint. However, not every disc features those telltale rock fragments, suggesting different paint batches were made with different, possibly better quality, tools1. 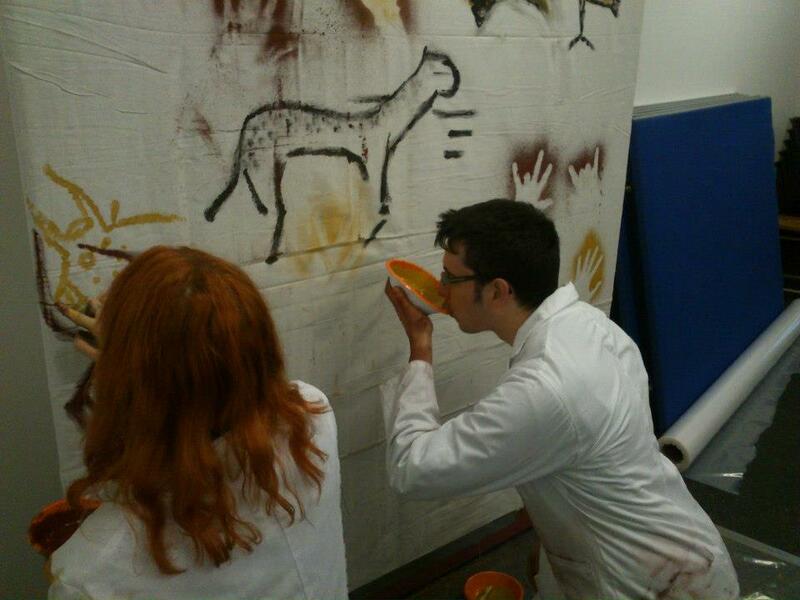 Who made the cave paintings? As well as shedding light on the techniques used, experimental archaeology also shows what happens when they go wrong. Or at least, less right. It turns out that when you to try to use a straw to make cave paintings like this, you can’t paint too far over your head. Otherwise, the disc spreads out and becomes real splotchy1. Based on the distance this happens and the splotchiness of the discs, d’Errico et al. were able to figure out the maximum height of the artists was around 170 cm tall (or 5 foot 5, if you’re an imperial savage). This confirms adult males were involved in the creation of these discs1. More papers need a cartoon abstract1. Of course, that’s just the maximum height. Many of the discs were made by smaller individuals, raising the possibility that females and kids were also involved in making this art1. 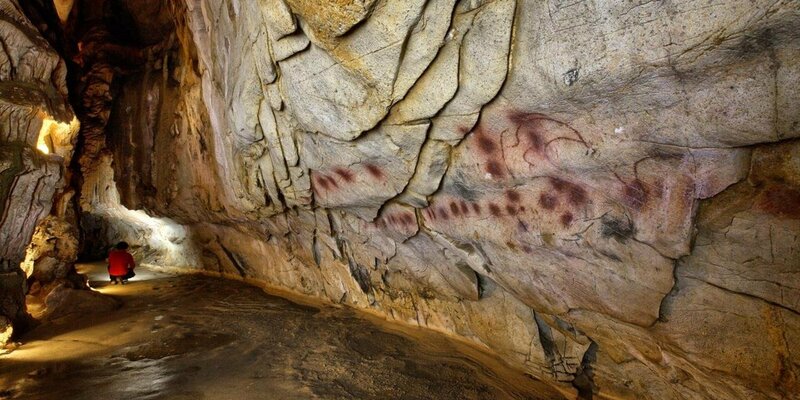 Taken together, this paints (haha) a fascinating picture of the oldest cave art. We’ve got different people using different materials and techniques to make similar discs. If their image wasn’t close enough, they even touched up the discs by hand. This shows the art was being made over a long period, possibly several generations, but always with a similar goal in mind. We don’t know why, but they invested a lot of effort into this, travelling deep underground to draw. Clearly, it was clearly important to them, maybe as part of a ritual, coming of age ceremony, or marriage. A few thousand years after the discs were made, people in El Castillo start producing these hand stencils instead. Although they could well have been made at the same time, as the dating of cave art is tricky, to say the least2. These stencils were made by blowing pigment through a straw, much like the earlier discs. And, just like those discs, we can use this art to learn about the artists. However, we can get even more information out of it since they’re using parts of their body3. For instance, we know most of them were right-handed since the stencils are of their left hand. We can also tell who they were based on the fingers, since (typically) males and females have different finger lengths. It turns out that these stencils seem to have been made by mostly females, with a few, mostly young, males sprinkled in for good measure3. 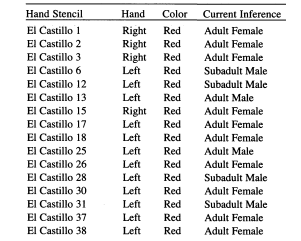 Analysis of who made hand stencils3. So, despite the similarities, it’s clear things were changing. Perhaps it represents a shift in culture, with women now in charge of ceremony/art. Or maybe, if they were made at the same time as the discs, we’re looking at segregated rituals. Men go make discs, women make stencils. Whatever they were doing, I wonder if they ever realised that these would become the best-preserved traces of their existence. Or maybe that was the point. d’Errico, F., Bouillot, L.D., García-Diez, M., Martí, A.P., Pimentel, D.G. and Zilhão, J., 2016. 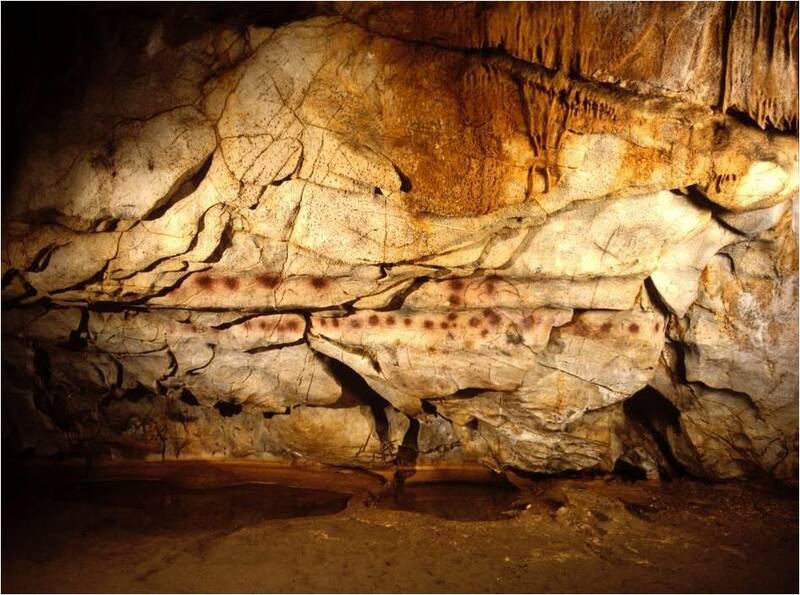 The technology of the earliest European cave paintings: El Castillo Cave, Spain. Journal of Archaeological Science, 70, pp.48-65. García-Diez, M., Garrido, D., Hoffmann, D., Pettitt, P., Pike, A. and Zilhão, J., 2015. 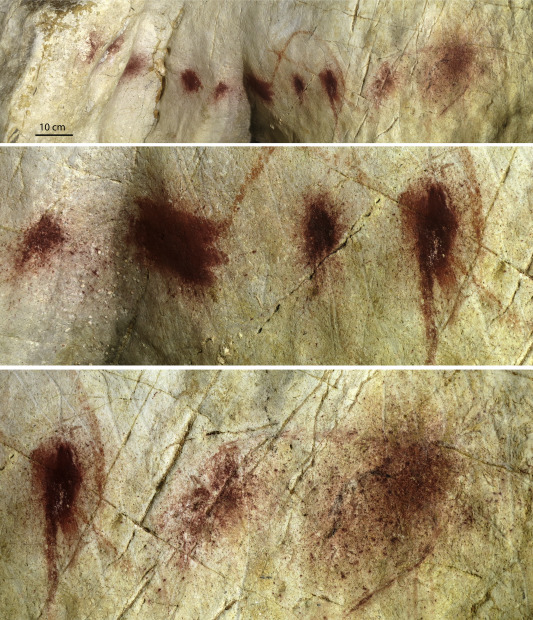 The chronology of hand stencils in European Palaeolithic rock art: implications of new U-series results from El Castillo Cave (Cantabria, Spain). Journal of Anthropological sciences, 93, pp.135-152. Snow, D.R., 2013. Sexual dimorphism in European Upper Paleolithic cave art. American Antiquity, 78(4), pp.746-761.